November 29, 2018 – Following the success of the Silver Reverse Frosted Pegasus Bullion, Pobjoy Mint has released a new version of this popular coin this time produced in 1oz Fine 999.9 Gold Bullion. The design shows Pegasus, the mythical horse, rearing up with his wings spread. The obverse features an effigy of Her Majesty Queen Elizabeth II designed exclusively by Pobjoy Mint. 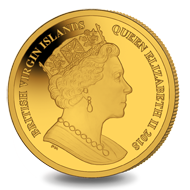 British Virgin Islands / 100 dollars / gold .9999 / 31.103 g / 32.70 mm. 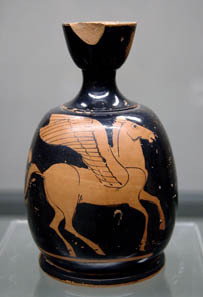 Pegasus depicted on an Attic lekythos, 480 – 460 BC, exhibited at Staatliche Antikensammlungen München. Over the years many British Virgin Island coins have featured horses especially when celebrating Royal occasions and Olympic equestrian events. 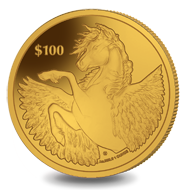 This made Pegasus the perfect choice for the new flagship coin for the British Virgin Islands and we are pleased to include this new 1oz Gold Bullion version in the collection. For more information on this coin visit the British Pobjoy Mint website. There are many great videos available online explaining the mythological origin of Pegasus. Pegasus was also the symbol of Corinth. CoinsWeekly has explained how this connection came about.